More than 8,000 U.S. doctors were trained in the seven countries facing new travel restrictions. In the week since President Trump issued an executive order temporarily banning citizens of seven Muslim-majority nations — Iran, Iraq, Libya, Somalia, Sudan, Syria and Yemen — from traveling to the United States, experts have raised many important moral, economic and political questions. But the order raises medical questions, too. 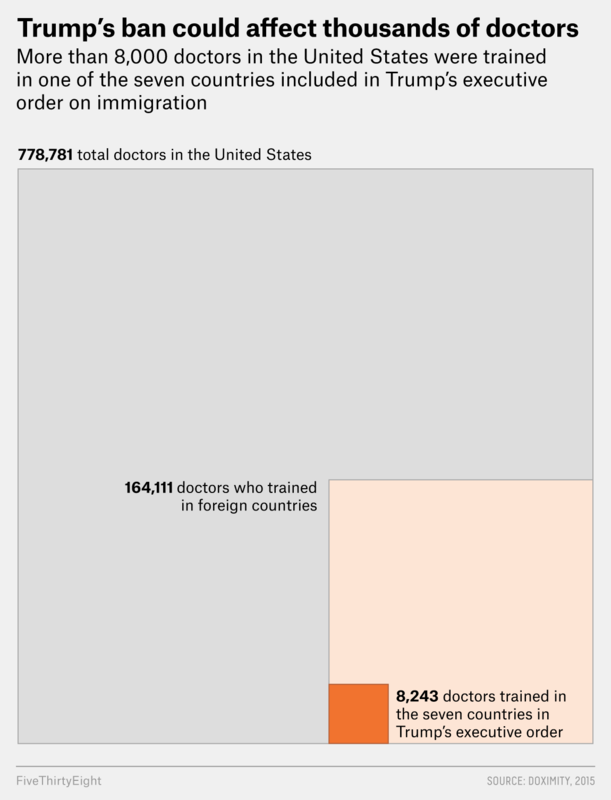 The U.S. relies heavily on foreign medical graduates, including some who trained in countries affected by the recent executive order and some who trained in other Muslim-majority countries. It’s no secret that the U.S. faces a physician shortage in many parts of the country, especially when it comes to doctors in relatively low-paying specialties like primary care and psychiatry. In some rural counties, the shortage is so severe that states have tried to compensate by using extreme measures like allowing untrained recent medical graduates to practice unsupervised. Like many Western nations, the U.S. has come to rely heavily on medical graduates who trained internationally, although these graduates face significant barriers to being allowed to practice in the U.S., including burdensome licensing processes and duplicative training. Still, foreign medical graduates comprise more than one-fifth of all practicing physicians in the U.S. Where a doctor trained does not necessarily tell us where that doctor is originally from — and thus whether he or she may be subject to the immigration order — but it serves as a useful proxy, if we assume that most doctors train in the country where they are born. Our research finds that foreign-trained doctors play an even larger role than their share of the physician workforce would suggest because of the areas and specialties in which they often practice: rural, underserved regions and specialties facing a large shortage of practitioners. And of the foreign-trained doctors in our sample, about 5 percent — approximately 8,000 people and 1 percent of all doctors — completed medical school in the countries that are affected by the ban. We can’t say for certain how the ban will affect all these doctors — that depends on each person’s immigration status and how the executive order is implemented — but it has already prevented some from re-entering the country. Among the 778,781 physicians whose records we analyzed, 21 percent (164,111) graduated from a foreign medical school. Compared with domestic medical graduates, physicians who trained abroad disproportionately work in the specialties with the largest doctor shortages: psychiatry, internal medicine, family medicine and pediatrics. For example, 27.6 percent of all psychiatrists and 26.4 percent of physicians specializing in internal medicine graduated from foreign medical schools, compared with just 12.4 percent of doctors practicing radiology and 9.8 percent of those in the surgical subspecialties — fields that are better compensated and attract plenty of domestically trained physicians. So, our findings suggest that foreign-trained physicians are most likely to work in the specialties with the greatest unmet demand — and that they likely provide a vital influx of talent and labor where patients need it most. Foreign medical graduates are also more likely to practice in areas of the country with the most severe physician shortages. Using our physician database and the county population counts from the U.S. Census, we calculated the number of doctors per capita in each county and defined high-shortage counties as those in the bottom quintile of doctors per capita and low-shortage counties as those in the topmost quintile. In counties with the greatest physician shortage, 25.6 percent of physicians had trained abroad, compared with 19.2 percent in the low-shortage counties. Just as foreign-trained physicians are more likely to meet demand in the high-shortage specialties, they’re also more likely to meet demand in high-shortage parts of the country. This should not be surprising; some visa waivers specifically require foreign medical graduates to practice in underserved areas. High-shortage counties have something else in common: They tended to vote for President Trump. In counties that voted heavily for Trump,2 22.4 percent of physicians were trained abroad, compared with 20 percent in counties that voted heavily for Hillary Clinton,3 a statistically significant difference. Ironically, then, foreign-trained physicians are more likely to be serving the needs of counties that voted heavily for Trump — where they may find the least support for their presence if those voters also support Trump’s immigration decisions. What about doctors from countries that were specifically targeted by President Trump’s executive order, or from Muslim-majority nations that were not mentioned in the order? Physicians who trained in the Middle East,4 about 15,000 total, make up nearly 10 percent of all foreign-trained medical graduates practicing in the U.S. today, and their work follows the same pattern as that of other doctors trained abroad — they disproportionately work in less-lucrative specialties, in high-shortage counties and in counties that voted heavily for Trump. It’s also important to note that about half of all foreign-trained doctors come from South and East Asia, which have not yet been targeted by changes in immigration policy; the president’s chief strategist, however, has expressed misgivings about highly skilled immigrants from that region. Foreign medical graduates play a vital role in our medical system. We rely on them to provide much-needed care in underserved regions and medical specialties. Policies that limit immigration, such as the recent executive order and rumored changes to a visa program on which these medical graduates depend, would be highly disruptive to the medical system — and could end up doing to the greatest harm to the very people who supported Trump the most. The information in this database, which we’ve previously verified as reliable by performing a manual audit of a sample of doctors, is assembled from multiple sources, including the American Board of Medical Specialties, specialty societies, state licensing boards, and collaborating hospitals and medical schools. Because the information is compiled by governing bodies, it is more comprehensive and accurate than a self-reported database would be. Counties where Trump received at least 80 percent of total votes. Counties where Clinton received at least 80 percent of total votes. Bahrain, Cyprus, Gaza Strip, Iran, Iraq, Israel, Jordan, Kuwait, Lebanon, Oman, Qatar, Saudi Arabia, Syria, Turkey, United Arab Emirates, West Bank and Yemen. Andrew Olenski, BA, is a research analyst at Harvard Medical School.